Eagle bed and breakfast travel guide for romantic, historic and adventure b&b's. 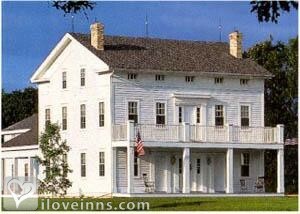 Browse through the iLoveInns.com database of Eagle, Wisconsin bed and breakfasts and country inns to find detailed listings that include room rates, special deals and area activities. You can click on the 'check rates and availability' button to contact the innkeeper. Eagle, Wisconsin offers attractions such as Old World Wisconsin, a museum that features the farm life of immigrants, Eagle Historical Society, and Ten Chimney's Historic Site. Another important similar destination is East Troy Railroad Museum. Those who want a close encounter with nature can go to the nearby Kettle Moraine State Forest. In the winter, Eagle transforms into a white paradise and it is during this season that attractions like Winterhorse Park Icelandic Horse Farm as well as Ice Age Park & Trail become popular destinations. Eagle bed and breakfast inns are located near these sites. The restaurants in the area include The Union House and Jimmy Wade's Heaven City. By Eagle Centre House B&B.